The Iraqi authorities must prevent collective punishment being meted out to relatives of suspected IS militants and ensure that the army doesn’t displace civilians and move them to prison-like camps, Lama Fakih, HRW deputy Middle East director, told RT. Concerns are growing about the fate of civilians trapped in Mosul and those who fled the city, as the Iraqi security forces wrest back the western part of the city from Islamic State (IS, ISIS/ISIL) terrorists. “We have documented a number of instances when individuals on the way out of Mosul trying to get to security have been detained, the vast majority – men, and in some cases, boys,” Fakih told RT, adding that once the people are detained they are not allowed to get in touch with families. The government is “not informing relatives about the whereabouts of their detained loved ones and they are not allowed to communicate with them,” Fakih said, stressing that the Iraqi authorities must not infringe on refugees’ freedom of movement and must provide them access to a telephone. 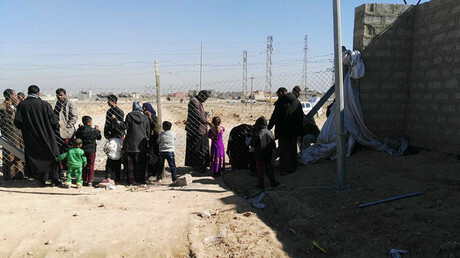 By enforcing arbitrary detention and mass eviction of families in the governorate of Salah al-Din, the Iraqi authorities are acting on a local decree that forbids the families of jihadists to reside in the area for at least 10 years. Although the stated goal of the controversial legislation was to protect militants’ relatives from the revenge of the grieving victims of ISIS, it has come under fire for indiscriminately punishing people not found guilty of any crime. “We are very concerned about the conditions in detention as well as of forced displacement of those who are not accused of doing any criminal offense but just accused of being a relative of an ISIS suspect,” Fakih said. Such practice is in clear violation of the Geneva Convention, Fakih said, which puts the Iraqi government at risk of being accused of war crimes. “We are continuing to call for the Iraqi federal government that they take steps to ensure that their soldiers are not committing war crimes by forcibly displacing families who are being punished for the acts of another relative,” she said. Of a particular concern to the organization are some 200,000 people that have already been displaced. 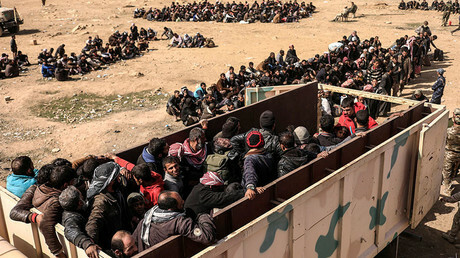 Meanwhile, as the offensive enters its decisive stage, up to 250,000 more people are expected to leave the city in the coming weeks, according to UN estimates. The intense bombing campaign by the Iraqi forces, backed by the US-led international coalition, has been criticized for inflicting heavy civilian casualties. The bitter fighting of the last few days has brought considerable ground gains to the Iraqi army. On Monday, Iraqi elite units recaptured a key local government complex in central Mosul, encompassing the Nineveh governorate headquarters, a courthouse, a main branch of the central bank, a police directorate and a Turkish consulate. The breakthrough is seen by Iraqi commanders as a game changer in the battle for Mosul’s complete liberation. Since securing the government complex, the Iraqi troops moved to force out jihadists out of the area of Bab Laksh, south of Mosul, the Joint Operation Command reported on Tuesday. “Security forces are currently engaged in fierce battles with Islamic State inside the narrow alleys in the area,” Colonel Khodier Saleh said in a statement, as cited by Iraqi News. So far, over 30 militants have been killed and six more arrested as result of the operation. On Tuesday, the head of the Iraqi army’s Counter-Terrorism Force reported that the Iraqi army has regained control over 60 percent of western Mosul.